"We stand today on the stage of world affairs, before the audience of world opinion. We have come together to assert our role in the direction of world affairs and to discharge our duty to the great continent whose two hundred and fifty million people we lead. Africa is today at mid-course in transition from the Africa of Yesterday to the Africa of Tomorrow. Even as we stand here, we move from the past into the future. The task on which we have embarked, the making of Africa, will not wait. We must act, to shape and mould the future and leave our imprint on events as they slip past into history." 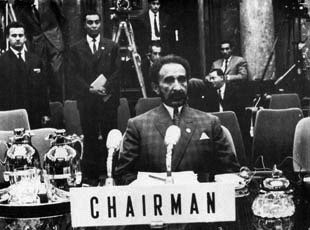 His Imperial Majesty Emperor Haile Selassie I of Ethiopia, 1963. Oh, that all Africans were cognisant of this! More than ever in our history as the collective victims of injustice and dehumanisation do we need to have this outlook, this vision. But, alas, it is not so. I look around and I see so much that needs to be fixed. I start with my own country, which has been held hostage by its own liberators. African leaders have reacted with an admission (often tacit) that Mr Mugabe no longer has the free support of the Zimbabwean people, they have been united in refraining from openly voicing their views for fear of appearing disloyal to the African dream. Meanwhile, Africans in South Africa reacted to the presence of Africans from other parts of the continent in a most savage manner. We are all shocked by their behaviour, especially at this occasion when we commemorate the founding of the O.A.U. However, one has to remember that the presence of these Africans in South Africa is not pursuant to the African Dream, but a by-product of the African Nightmare unleashed on the continent. On the cultural front, progress has been minimal. Even in this world of Internet and Skype and Facebook, most Africans are more aware of the Western world than their own. Thus, a Nigerian who could not name a single Malawian author or a single Mauritian singer would only find common ground with these other Africans if they too like Beyonce or Kanye West. While the various nations of the Western world see themselves as the off-shoots of the Graeco-Roman civilisation, African peoples cannot see the common history. So, what to do then? Surrender? For me, this is not an option. Not yet, any way. I think that those of us who have a vision for Africa should hold on to it, if only to pass it on to the next generation until there is one that will arise above the obstacles and bring it to reality. That is what I shall do. Africa Day Greetings to all! !